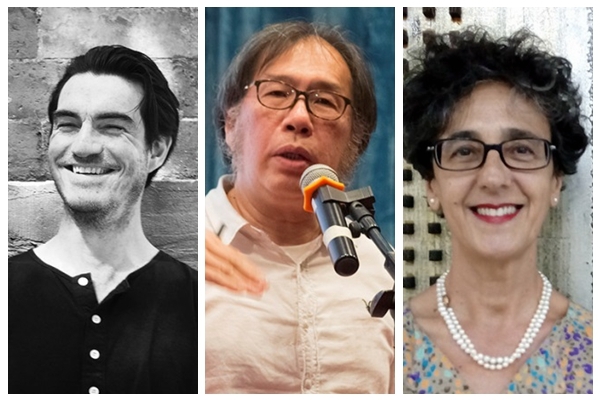 This panel discussion which is jointly hosted by the Writing & Society Research Centre and the Australia-China Institute for Arts and Culture, will open with the sounds of the Chinese language with some poems read by Xi Chuan, followed by their translation by Eric Abrahamsen. Giuseppa Tamburello will then discuss contemporary Chinese literature, and the other speakers will reflect on the translation process and on the writing of poetry. This will be followed by questions from the floor. FREE. Registration Essential. Please RSVP HERE (opens in a new window) by 26 November 2017. Xi Chuan is a Chinese poet, essayist and translator. He graduated from the English Department of Beijing University in 1985. Previously a visiting adjunct professor at New York University (2007), an Orion visiting artist at University of Victoria, Canada (2009), and professor of Chinese literature at the Central Academy of Fine Arts in Beijing, he is currently a professor of Beijing Normal University. Xi Chuan has published nine collections of poems, including Depth and Shallowness (2006) and A Dream’s Worth (2013), two books of essays and two books of critical writings, in addition to a play and numerous translations of Ezra Pound, Jorge Luis Borges, Czeslaw Milosz, Gary Snyder and others. His awards include Lu Xun Literary Award (2001), Cultural China: Person of the Decade (2001-2011) by Shanghai Oriental Morning Post. He was also one of the top ten winners of the 1999 Weimar International Essay Prize Contest, Germany. His work has been widely anthologized and translated and published in more than twenty countries. His book of poems in English translation Notes on the Mosquito: Xi Chuan/Selected Poems (tr. Lucas Klein) published by New Directions, New York, 2012, was awarded ALTA’s 2013 Lucien Stryk Asian Translation Prize and was shortlisted for American 2013 Best Translated Book Award. Eric Abrahamsen comes from Seattle, USA, and has been living in China since 2001. During that time he has worked as a reporter, editor, translator and publishing consultant. In 2007, together with a group of Chinese-English literary translators, he founded Paper Republic (http://paper-republic.org/), a website introducing Chinese literature to English-speaking audiences. His translation publications include Xu Zechen’s Running Through Beijing, published in 2014 by Two Lines Press, for which he received a National Endowment for the Arts grant, and which was short-listed for the National Translation Award; Wang Xiaofang’s The Civil Servant’s Notebook; and he also received a PEN translation grant for Wang Xiaobo’s essay collection My Spiritual Homeland. He now works as an editor and publishing consultant. He produces the literary magazine Pathlight, maintains the Paper Republic website, and runs an annual publishing fellowship in Beijing. Giuseppa Tamburello (or Giusi, or 朱西 In Chinese) is a “ricercatrice confermata”, a senior lecturer, at the University of Palermo in Italy. She teaches Chinese language and Chinese literature, and does research on Modern and contemporary Chinese literature. Her interest focuses on short stories and on poetry. On the basis of Leo Spitzer’s stylistic criticism methodology, her approach to literature involves comparative literary studies, multidisciplinarity, multiculturalism. She publishes in Italian, English and Chinese, does extensive translation work from Chinese into Italian, and joins conferences in Italy and abroad. Edited by her, Concepts and Categories of Emotion in East Asia has been published in 2012 by Carocci Editore, whereas last August her Antologia di racconti postmaoisti (1977-1981) has come out with Aracne Editrice.